The presence of excess skin pigment, called ‘melanin’, in certain areas of your skin, leads to a condition known as ‘Hyperpigmentation’. In other words, hyperpigmentation is a skin condition, wherein dark patches appear on certain areas of the skin. Although this is not a disease by itself, it can be a detriment to one’s self-esteem. Hyperpigmentation may be the result of previous inflammatory skin conditions like medications, acne, or any diseases that affect vital organs. 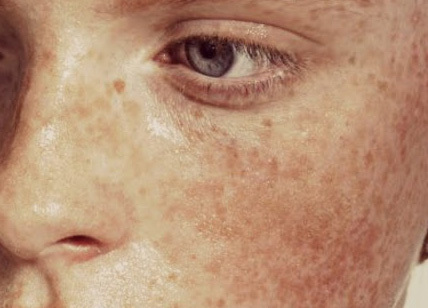 Hyperpigmentation is believed to be caused due to both internal and external factors. While the internal factors may be imbalances in hormone levels particularly caused during pregnancy, menopause or use of oral contraceptive pills, external factors could be due to various reasons like excessive sun exposure, wounds, a side-effect caused by certain dermatological procedures or treatments etc. Sometimes, inflammation in any part of the body triggers melanin production, which presents itself as brown spots or patches. Ayurvedic experts believe that every movement in a cell is governed by vata, which also play a role in migration and accumulation of the melanin pigment. As Bhrajaka Pitta governs our complexion, hyperpigmentation or hypopigmentation can occur due to imbalance in vata and pitta. Ayurvedic physicians usually diagnose the imbalance (whether vata or the pitta), and treat by balancing both. Plenty of water, fruits, legumes, garlic and onion are advised, as they help in managing the condition. Some ayurvedic physicians also believe that skin pigmentation issues could be due to imbalance in layers of skin, and various water therapies help in getting rid of toxins in the body, which may otherwise contribute to hyperpigmentation. The ayurvedic practice of ‘usnodaka’ (drinking 6 to 8 cups of boiled water) is considered as a remedy, as drinking boiled water, helps stimulate your digestive fire, which can help the body expel toxins that harm your skin causing hyperpigmentation. Ayurvedic medicine recommends several herbal remedies along with ‘usnodaka’ for hyperpigmentation. The herbal medicine to be consumed would, however, depend on your body type or dosha. People with pitta dosha are the considered to suffer the most from skin problems and hyperpigmentation. People with pitta constitution can consider adding small quantities of Indian sarsaparilla, fennel seeds, cumin, coriander and licorice to boiled water to help expel toxins which cause skin pigmentation. Alternatively, these herbs can also be added to your bath water too, in helping body to effectively release ama (toxins), which cause excess production of melanin responsible for hyperpigmentation. For hyperpigmentation caused due to acne, topical treatments like pastes made of chickpeas and water, or almond powder and goat’s milk can help in keeping your skin nourished and reduce inflammation, sensitivity and spots for too much pigment. The role of yoga also cannot be ruled out in treating hyperpigmentation, as some specific exercises can improve blood flow throughout the body, thereby delivering essential nutrients to your skin, helping to resolve skin issues like age spots or hyperpigmentation. To treat pigmentation on your face, apply a mix of lemon juice and honey. This acts as bleach, removing skin pigmentation. You can also apply a mixture of yogurt, honey and cucumber juice taken in equal proportions. Leave on for 15 to 20 minutes and wash off. Pigmentation on the lips can be removed by applying ghee or castor oil regularly, as they help in balancing vata and pitta. Another option is to apply a mix of almond oil with glycerine, honey and rosewater. Underarm pigmentation can be removed by using a pack made of yogurt, lemon juice, turmeric and gramflour. Apply and leave it on for about 20 minutes and wash off with lukewarm water. Repeat the process for several days to see results. Applying slices of cucumber or potato and leaving it on for 15 to 20 minutes works best for mild under-eye pigmentation. Take a teaspoon of turmeric powder and add a teaspoon of lemon juice to it, mix well and apply on affected area. Leave it for 15 minutes and wash off with cold water. Apply this at bedtime regularly. Crush a tomato and extract its juice. Add 2 teaspoons of oatmeal to it, and add half a teaspoon of yogurt. Apply on affected area, and leave it on for 15 to 20 minutes, and wash off with lukewarm water. Do this on daily basis. Mix potato juice with fuller earth and apply on affected areas to remove pigmentation. Squeeze out Aloevera gel from an aloevera leaf and store this in a bottle in refrigerator. Apply this gel over the affected areas for 20 minutes. It works by removing dead skin cells and regenerating the newer ones. Avoid exposure to direct sunlight between 9am to 4pm. Apply sunscreen every three hours, if you have to step out in the sun. Protect your eyes with good quality sunglasses, broad-rimmed hats and wear loose light coloured clothes. Keep yourself hydrated by drinking atleast three litres of water a day, as dehydrated skin is more prone to hyperpigmentation. Quit smoking, as it increases the free-radical content and adds to the pigmentation. Follow healthy lifestyle and preserve your natural biological rhythm, which includes yoga or exercise in some form, good diet and adequate hours of sleep. Skin cleansing atleast twice a day using oil is essential. Exfoliate at least thrice a week. Natural exfoliators like walnut or oatmeal or lemon juice are the best. Apply the exfoliator on affected areas in circular motions, as it helps unclog pores, prevents breakouts and reduces blemishes and pigmentation.